So you're thinking of herb gardening, or maybe you tried it last year and it was an utter disaster? Have no fear. There are a few simple mistakes that many herb newbies make (and I know, because I made most of 'em myself). Master these simple and practical tips for herb gardening and you'll be using your own fresh herbs like Mario Batali in no time. Fresh herbs are one of the greatest ways to increase the taste of your food healthfully. I often toss whatever leafy herbs are hand liberally into a salad to add unexpected variations in flavor (basil, oregano and dill are all great choices). Fresh herbs can add punch to sauces or create intensely flavorful crusts for roasted meats. While fresh herbs are now regularly available at grocery stores year round, growing your own herbs is a great way to build mastery over your food. Growing herbs at home can be easy whether you live in a house in the suburbs or an apartment in the city. Let it be known that I have the blackest of thumbs. I routinely kill houseplants and whether from too much love or too much neglect I never really know. Moreover, I live in a condo in Chicago, so I only have pots on my back fire escape as my city "garden." In fact, I'll argue that it is my black thumb that gives me the bona fides to give beginner gardeners tips, because I have figured out how to grow herbs and am painfully aware of every lesson I learned along the way. It surprises me how often I bump into friends who are flummoxed about some aspect of herb gardening. And strangely, I feel there are few practical guides to growing herbs on the internet for someone just starting out. Most of the advice is geared towards high end gardeners who can make sense of soil PH and whatnot. When I was starting out, what I really needed was some sort of herb gardening for dummies. So here is my quick and practical advice for growing herbs for beginners. Mistake 1: Growing from seed. When you first start out trying to grow fresh herbs, I recommend you begin by trying to grow from seedlings rather than planting your own seeds. These great little starter plants are widely available in grocery stores in the late spring. For the same price as a packet of fresh herbs from the produce section, you can buy your own little starter plant. Lots can go wrong in the seed to seedling transition (including not thinning out plants properly), so its probably best to begin by skipping that complicated task or you are in danger of washing out before you really begin. Mistake 2: Starting with the wrong varieties. I recommend you start by trying to grow fresh basil. It is the perfect trainer herb. First, basil grows quickly, allowing you to observe the effects of your care more easily. Second, basil leaves wilt visibly when not watered enough, but recovers well if you water the wilted plant. This makes basil a great ‘canary in the mineshaft’ to help you figure out how much water is enough. Mistake 3: Watering herbs like houseplants. Instead, water herbs a moderate amount every day. While some houseplants flourish with one solid watering per week, most delicate herbs require moderate and regular watering. This is particularly true during hot summer months. If you have good drainage at the bottom of your pot (at least a drainage hole, possibly rocks beneath the soil), it will be difficult to water herbs too much. Mistake 4: Not cutting early and often. As a novice gardener, it may seem like your puny little plant just isn't ready for a trip to the barber, but then you will find yourself sitting there wishing for leaves without much success. Again, basil is a great herb to practice pruning. As with all herbs, you want to cut the herb just above a set of growing leaves. 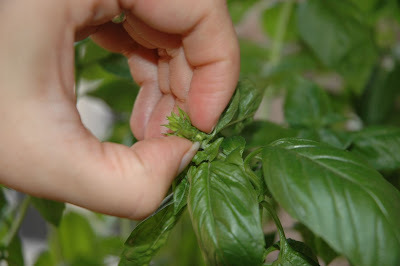 With basil, when you cut the plant that way, the originally trimmed stem will no longer grow. However, two new stems will grow around the original cutting, creating a “V” shape (see the photo above, can you spot the Vs?). 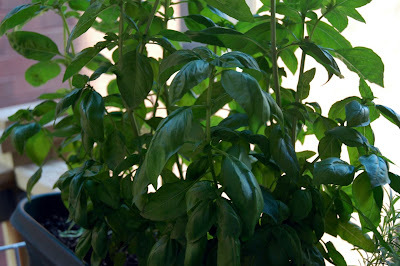 If you don’t trim basil aggressively, it will continue to grow straight up, and become too tall and top-heavy. Making your first trim approximately 3-4” above the soil produces a nice sturdy plant. Of course you want to be sure you are always leaving a few good sturdy leaves on the plant (see below). As it continues to grow, continue to prune it approximately every 3-4" for a nice solid plant. I like to let it grow for some time and then cut back to within 2-3 inches of the original cut. After only a few early trial cuts, this usually makes for a nice clipping with plenty of basil to use for a pizza. Mistake 5: Taking the leaves from the wrong place. When you are just starting out it seems to make so much sense to pick off a few big leaves around the bottom of the plant, and let those tender little guys at the top keep growing. Wrong. Leave those large tough old guys at the bottom alone. They are the solar panels that power your herb's growth. Once your plant is big enough to sustain a decent harvest, keep on taking from the top, as you have been when you were pruning. That way you get all those tender new herbs that are so tasty, and your plant gets to keep its well developed solar power system in place. Plus, if you pluck from the base and leave the top intact, you get a tall skinny plant that will flop over from its own weight (and yes, I know this from experience). When you pluck from the top, instead of clipping off just below a pair of leaves, you want to clip off just above a pair of leaves. It is a bit counter-intuitive as a novice, but trust me it works. The place where the leaf joins the stem is where new growth will occur when your plant sends off new stems in a V.
Mistake 6: Letting your plants get too randy. If you are pruning regularly, this may never become an issue, but unless you are growing something for its edible flowers, be sure to cut back herbs before they start growing flowers. My friend once brought me to her backyard garden and pointed, frustrated, at her wimpy, small basil plants. "I just keep tending them, but they don't even produce enough leaves to put on a salad!" she lamented. I pointed to the glorious stalk of flowers at the top of each plant, "That's your problem" I explained. Because herbs are kind of like college boys: if you give them half a chance, they will focus all their energy on procreation and neglect growth. If you want leaves, keep cutting off the little flower buds whenever you find them (see photo above), and it will encourage your plant to focus on growing more leaves. Mistake 7: Using tired soil with no nutrients. Tired soil that has been sitting in your garden or lawn for ages often looks grey and a little depressing. Would you want to grow in that stuff? Give your plants a dose of the good stuff and they'll thank you for it. I grow my herbs in a combination of potting soil, used coffee grounds (with a near-neutral PH, available for free at Starbucks), and organic compost. If I have some on hand, I also throw in crushed egg shells. Those without access to compost (and no deep commitment to organic growing) may find Miracle grow useful. My momma swears by it for tomatoes. A diluted solution of Miracle grow occasionally can help many herbs flourish. Mistake 8: Getting in a rut. There is an element to passion about herb gardening. In order to be good at it, you need to feel rewarded. So don't stick too long with one or two herbs just because they work. Branch out to a few other basic herbs that you will use regularly in your kitchen. There are few things more rewarding as an urban foodie than being able to pop out to the fire escape to clip fresh herbs to use in my cooking. 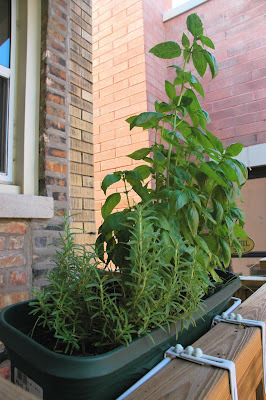 Once you have become comfortable with basil, I recommend moving on to try growing oregano, mint, rosemary and thyme. All are regularly useful herbs in the kitchen, and all are relatively easy to grow. You will notice that rosemary cleaves after cutting in a somewhat similar way to basil, but grows much more slowly, so the effect is difficult to notice. Some plants also respond to clipping by throwing out more full leaves at their base. I have long wanted to grow cilantro but have not had much luck with it. Mistake 9: You mean there's more than one kind of mint?When choosing herbs, read the label carefully. For example, there are two main varieties of oregano: Mediterranean and Mexican. Mediterranean oregano is the more common variety, and what you likely own if you have conventional dried oregano in your cupboard. I have Mexican oregano growing on my back fire escape. I love Mexican oregano in spicy dishes, for making beans from scratch, and often use it in tomato dishes where I don't want the flavor to seem too much like marinara. Similarly, there are many different kinds of mint. You don't want to be thinking of the pungent spearmint plant and accidentally take home the much more subtle (and not mojito savvy) applemint by mistake. Mistake 10: Feed me Seymour! If you are planting in soil instead of pots, take care that your cute little herb seedling doesn't become a giant plant that takes over your garden. A word of warning for oregano and mint: both can be voracious growers. If you are planting outside in a garden, rather than in pots, you may want to consider potting these herbs and then burying the pots in the ground. This will add a measure of control to the root systems of these herbs, which can otherwise take over a garden and strangle nearby neighbors. When in doubt, check out wikipedia, they usually are careful to point out which herbs are in danger of overwhelming your garden. And, speaking of mint.... never plant it directly in the ground. It will grow under sidewalks, around trees, everywhere, and totally take over everything. This I know....I put it in my herb garden, thinking I could contain it with rocks and paths... I was oh so worng! Cilantro is my favorite herb--and also the only one I don't grow. Its lifespan is just too short, you need to constantly keep replanting it in my experience. Great post...it reminds me to plant herbs in the pots on my deck...once the chance of frost is gone. Katie, great catch on the mint. That is definitely a spectacular grower that will take over. Private chef, thanks for the great compliments. It is always nice to get kudos for what amounts to a time consuming hobby. Laura-Cilantro drives me batty. I have tried to grow it without success several times. It seems like the perfect herb to grow because then I could just snip a bit whenever I wanted without getting those giant herb bundles at the store, but alas no. If you discover some grand secret to making it work, please let me know! Cassandra, glad you found some useful tips. I figure my mistakes have to be worth something if they can help someone else out. Vanessa, wisconsin is sort of tricky like that. Based on years of living there I can say the only time without any chance of frost is pretty much only July. Hopefully you hit a garden-inspiring warm front soon. I have bookmarked this page!! I cannot wait to start growing my own herbs, especially basil!! Thanks for the great tips. 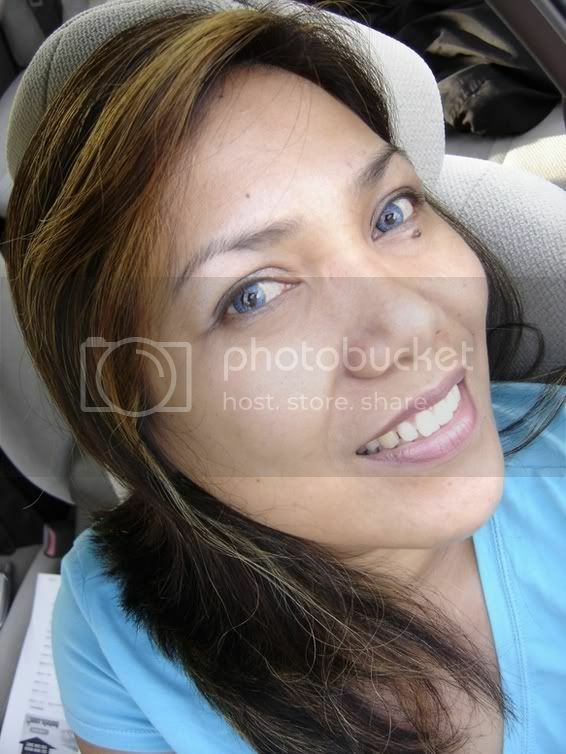 hi.. stumbled upon your blog thru Taste and Create.. thanks for these tips. I've been trying to grow herbs myself and have failed miserably. Your tips would surely help me. Just came across your blog and saw this post. Thanks for all that advise. I'm planning to grow some herbs in my small balcony and this comes at the right time! THose are great tips. I especially like #6 because it's so true! Antonio-I think you might have my favorite thumbnail ever. Best of luck with the herbs! Jes, Aparna, Nob and Y: glad to hear you find the tips helpful. I have my fingers crossed that you all will soon have so much basil you'll be making home-made pesto. (and if you DO make home-made pesto, be sure to let me know so I can check it out). Very timely for me to stumble upon this post. My husband just planted some random herbs and is now scratching his head trying to figure out how to properly care for and harvest them. Thank you for all the great information! Very good tips here that I too learned the hard way. I have been successful growing numerous herbs for a number of years now. I love my kitchen garden. I thought I would add a few tips I didn't see covered here. Snipping from the top: the one herb you want to take from under is parsley. Cilantr: I love this herb. The secret to growing it is it loves cool weather. Mine is already going to seed. It is true to keep topping the seed flowers to extend the growing. However there comes a time when I let my cilantro go to seed and it reseeds automatically for the next season! Yeah! Bear in mind I live in south Texas though. One of my favorite herbs to grow is fennel. I don't grow it as much for me as I do for my butterflys! The monarch catapillars love the fern like texture. I grow bronze and green, and they love both. If you grow host plants the butterflies will grace your yard for feeding them! Lastly, if you want to grow sage, it has different water requirements than most other herbs. They don't like their leaves or feet wet. I've about written a book here. Enjoy your newfound passion! I enjoyed your tips and they are so helpful. The only other thing I could think of is this. Some people do not know that when you plant parsley and I believe Cilantro, they get full of caterpillars and they eat the parsley, but don't mess with them, they turn into beautiful butterflies. oI'm also a Chicago herb gardener! You can fit a surprising amount of growing space on and around a city porch. My pet rabbit helps with the "fertilizer", so it's pretty much all organic and all things we can both eat. Are there any herbs that will weather the winter and grow year round? Cilantro is so hard to grow in pots because it has a long single root system. It needs a very deep area to be able to grow. I used a 2-3ft deep pot and it grew amazingly. I have just moved it to my garden and I am hoping that it will take. If not its back to the way oversized pot!!! we have Rosemary plant we just leave in our garden (it's almost 3 feet tall) If only someone have told me about Mint... it's took over half of the garden. My parsely went to seed, so I collected the seeds and planted them again, has happened about 3 times now. Some of this stuff is things I never would have known. Another word of advice about mint. If a plant has square stems it belongs to the mint family. I was not paying attention and planted lemon balm directly in the ground 3 years ago. It has become a real problem, taking over the garden and even coming up in the lawn on the other side of a sidewalk! Beware! I've had the same issues with cilantro and have resorted to the huge bunches in the produce department. Do you know it freezes well? You can just chop it all up, put it in a freezer zip lock bag, and put it in the freezer. Then it's easily accessible for whatever you want to use it for in the future, and in whatever amount. I've had some in my freezer for a couple of months that I've been using little amounts out of gradually. Erin, I hate that about cilantro! I will tell you that I have had really good luck with growing cilantro from seed. My cilantro plant from the nursery went to seed and I shook a lot of that on the ground and save a lot too. I sew the seed in intervals throughout the summer so I always have some. In fact, a ton of my cilantro survived our winter this year and is already a foot high and is so prolific like a ground cover right now. It's March and we are in Ohio, zone 6! I found this post on pinterest in perfect timing because I am going to start a little herb garden on my balcony. I was talking to a friend and mentioned that I wanted to also include cilantro but she told me it was too late in the year for it, and that it prefers colder weather. Maybe that is the problem??? Cilantro is really easy if you give it some space and time. Not great for pots but I planted some in my little 4X4 garden one year and it keeps coming back happily each spring. Snip what you want and let the rest go to seed (the seeds can be dried as 'coriander' but be sure to let some re-seed). Plant it with something that will shade it during really hot weather. it's nice to hear that even the experts are having trouble growing cilantro! i've tried it twice, along with other herbs, and when the cilantro starts to get super sad looking, i get disheartened and usually give up on my little patio herb garden. so thanks for the encouragment - i'm going to try again this year with basil, mint, & oregano, and just pick up a bundle of cilantro from the farmer's market whenever i need it! Italian parsley is even easier to grow than basil, and even more versatile. My mother warned me about growing peppermint. I ignored her thinking how nice it would be to have peppermint tea. After a couple of years it had roots that took over a half acre of land. Even the rototiller couldn't stop it. By all means grow it in pots! I just found your post, and it's great! Last year I grew cilantro (from seed) and it grew like a weed. I didn't know any of these tips (which I plan to promptly apply), and think that maybe cilantro is the opposite of the other herbs? I treated it BADLY and mine did well (though nothing else did). I watered it once a week, and neglected it except when I wanted some cilantro. I planted cilantro in a pot last year and my dog had dumped it (seeds). I thought all was lost and gave up when just a few weeks later I had it growing throughout my whole garden. I found it to be the easiest herb I have grown so far. I will be venturing out to other herbs this year, thanks for the tips. Oh, I should have found your website and this article before buying my herbs seeds. Oregano, mint and parsley (?) on the way! I´ll surely be back for more info! And thank you for sharing this great piece of advice! I knew about mint, but I didn't realize oregano was also an aggressive grower. Glad I saw this before I added it to my herb garden. I will grow it in a pot. Thanks! Cilantro grows better from seed (one of the few). Once it dies at the end of season, scatter the seeds pods and you'll have more cilantro than you know what to do with! I have not had much luck with cilantro, but it seemed to grow better seeded directly into the garden than as a transplant. I'll try it again this year. Good luck! I have grown herbs and taught about growing them for years and I have to say this is one of the better posts on the subject I've seen to date. Definitely sharing this one. I can see you learned your lessons well. Thanks to everyone for sharing your experiences! I do think cilantro is one of the classic cool weather herbs, so it always performed poorly for me when I lived in Nashville. But I'm going to try again now that I'm back in Zone 5 midwest. @Pinay: depending on your climate zone, there are herbs that will stay usable year round. If you live in alaska, the answer is mostly no. But if you live in zone 7 or warmer there are common herbs that are perennial in your zone, and may even remain ever green and usable year round. When I lived in Nashville we used our rosemary, sage and thyme through the winter, even harvesting from under a light dusting of snow. Google perennial herbs to see which suit your zone. I have had a similar experience with mint. Luckily it was in a window box, but it still tried to take over. I buried the pot in the soil and still had some suckers sneak over the rim and spread to the other side of the planter. I was actually thinking of planting Mint in my yard. I am allergic to grass, but I LOVE the smell and taste of mint. My favorite place to sit when I was a kid was on the back steps, with a book, next to the Spearmint plants. Every so often, I would just reach over and pluck the leaves to chew on!!! thank you for the tips!! it really helps!! PS: is it okay if I link your post to my blog? easy way to enjoy harvested herbs year round is to dice it up and freeze it with a little water in ice cube trays. you can store the cubes in freezer bags and add what you need to your recipes - taste as good as the day it was picked - enjoy! Thank you so much for these tips! I didn't follow your first rule about growing from seeds because I wanted to try a new experience (*sheepish look), but my herbs seem to be doing ok so far! I'm learning a ton about growing herbs and this definitely helps, thanks! Great post. Have been growing herbs for a while and still found some interesting advice! I love these tips! 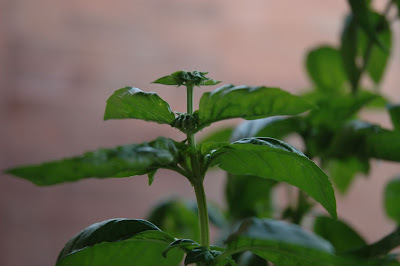 I'd add that basil needs much warmer weather than many other herbs; in many areas it's crucial to wait before planting. Here in Seattle, where it's actually pretty mild, I usually have to wait until late May/early June to plant basil and have any success. But then it goes gangbusters through September or so and I'm a happy herb gardener! I hope I am not repeating something already said, but GARLIC CHIVES are also very invasive and will take over gardens or boxes. thanks for the tips ! I am trying tarragon and cilantro. fingers crossed. Herbs like lean soil and don't need water every day, my friend. I stumbled on this post and I am SO thankful for it. I'm trying my second herb garden this summer, after a complete failure a couple of years ago. I have them all growing in pots and am looking forward to using your harvesting tips soon! Yeah! Thanks for the post! I am trying to grow herbs for the first time this year. I planted some stuff a couple of months ago and it is doing well (and I did plant from seed). I have basil, oregano, parsley, and dill. I have been wondering about the basil because it is getting pretty large and I have not pruned it any (over a foot tall). It is also beginning to flower, so even though it is 10:PM I am about to go outside and pinch back those flowers!!! I thought my dill was doing awesome... and it is... but I realized dill grows to about 3 feet high and mine is only about 10 inches. LOL! The good it that I have not killed it, so it is okay if it is small. I am thinking I might transfer it to a deeper container and see what happens. It is fun to watch it all grow and since I have my expectation low this is a great beginner learning year for me. Our Cilantro is crazy--I agree with the above poster who said it likes neglect. Ours reseeds itself every year(in its own bed and all along the path too.) We clip off what we want until we are overflowing, then we let the rest flower out. It get watered with the rest of the vegetable garden, but it starts peeking out long before we actually get around to planting the rest of the garden and before we begin watering at all. However, we can't get it to grow inside from seed--it gets very spindly, unlike outside where it bushes up pretty quick. We live in So. Colorado, and it's pretty hot/dry all summer. Just wanted to throw in a tip my sister gave me regarding freezing parsley. She chops it up, as the other reader suggested, then freezes it in one of the small, squat water bottles. This allows her to just unscrew the lid, shake out what is needed, and toss it back in the freezer. I love it! Wow this is a brilliant post, thanks. I definitely did that intuitive killing-the-solar-panels thing :D Just got some new herbs yesterday so this is super handy. Another great fertiliser is worm wee - I've just moved into an apartment but really want a worm farm so I can get free fertiliser that doesn't smell! This spring my mom came for a visit and helped me plant my garden after I built a raised garden box. Before planting the cilantro she actually cracked the seeds by rolling over them with a rolling pin, then she soaked them in water for a day or so before planting the seeds directly into the garden. She's always had plenty of cilantro in her garden each year. As for her mint...she controls the spreading by planting it in a large container. Hi! Thank you so much for the post! I am right now trying to grow basil - bought it in target for $1 in those tiny pots. Right now I have 4 pots with 5-6 stems in each from that tiny one pot:) I have a question: so you are saying that I should fully cut the top of the basil once it reaches 3-4"? thanks for the herb tips. Tomorrow morning will find me frantically digging up my tiny spearmint plant before it takes over my husbands lovely garden...oops! Am I safe to leave parsley and thyme in the ground? Thanks for the gardening tips! I hope my next round of herbs will grow and not died on me within a week of buying them! Perhaps I should have found this site at the beginning of the year. This is my first time really trying to grow herbs/veggies. I started tomatoes, green bell pepper, basil, oregano, cabbage, asparagus, and lettuce from seeds (and I attempted to grow rosemary and strawberry from seeds but they did not grow...so I bought a couple strawberry seedlings and they are coming along nicely). I have not cut any of my basil as of yet, but that will be happening today! Thank you so much for your blog! Do you have any tips for the other things I'm growing? Question about Rosemary.... I'm in Brooklyn and have herb pots in my kitchen. My Rosemary always gets this powdery white stuff on it that eventually kills it. WHAT IS THAT? I just tried Neem oil - safe for people and cats - but it's still there. Adivce anyone? @All: Thanks for all the positive feedback, repins, links etc. Much appreciated, and glad to hear you found my lessons learned helpful! @Linda: yes you are safe with parsley and thyme. @Anonymous: You make an important point, albeit in a somewhat snarky way my friend. True, the general received wisdom is that Mediterranean herbs planted in the ground have a better culinary flavor when grown on lean soils that more closely approximate their native mediterranean soil conditions, and plants of all types that are grown in ground grow better with a few deep waterings that encourage deeper root development and may help plants weather drought better. However. it has been my experience that for most herbs, 1) the difference between the quality of taste of identical herbs grown in lean and rich soil does not make up for the more marked difference in the ease of cultivating them (except mint, which I find does taste markedly different) 2) herbs grown in pots are considerably different in their cultivation demands than those grown in ground, especially with respect to water needs, because they are unable to develop the deeper roots that in-ground plants can, and container drainage prevents them from becoming too waterlogged. Glad to know I didn't get a bad batch of cilantro plants. Guess I will just stick to buying that in the store. But say, I hate to waste what I grow. Has anyone had any experience with drying or preserving their herbs? hey i am an avid city gardener and would love to offer you a tip on cilantro... you suggested that beginners not plant from seed, but i take it that you have begun doing so yourself.. i start my cilantro seeds about two weeks apart for two months. you can do this really easily with clear plastic cups as mini green houses. cilantro has a really short lifespan, and no matter how much i seem to cut back the beginnings of flowers, once they start your plant is doomed lol. so i plant the seedlings in a steady progression so as to always have a good plant. i do let one go completely to seed so i can save them for next year!! Cilantro is at the top of my list for flavor. Living in North Central Texas it is used in many Mexican dishes. I have grown it for years. It is most definitely a cool weather plant. As soon as the temps get to above 60 at night and 80's in the daytime they will bolt. No way to stop it. It is then that I leave it alone and let it flower, seed and die. I save some seed and let the others fall where they are. First cool spell it germinates and repeats. Requires full sun. If you grow it in a pot, it needs to be a very large pot....way too big for a windowsill. Nature governs the seasons and there is no way to fool this plant into thinking any different. A warm home in the winter is definitely not a good environment. Just my two cents. Just wanted to add that thyme is an incredibly slow grower, especially from seed. If you try growing it from seed, expect it to be six months or so before it's "harvestable." ( Mojito Girl here ), do you think think will survive a transplant to a pot? I don't want them spreading like a wildfire? So THAT'S why my basil plants keep dying...I will stop taking the bottom leaves and cut above 2 growing leaves near the top. Thank you! A friend told me that CULANTRO is easier to grown than CILANTRO and gives you more leaf and tastes better than cilantro. Start it from seed and plant near where your AC drips. Strange but true. She said it likes constant moisture so this makes the perfect spot. It will reseed every year. I found it almost impossible to grow rosemary from seed, so I went with a miraculous seedling. Anyone have any tips for sage? It started out great, but died off. Does it need extra care? I live up north and plant cilantro from seed before the last frost date- it grows like crazy that way. I haven't had luck with re-seeding it though throughout the summer. Thank you so much! I too am a black thumb, but want to grow herbs! Great advice. Love your sentence about herbs and college boys! Mind if I quote you in a tweet? Excellent tips, I agree Basil is the best herb to start out with. Once I started pruning my basil as described the plant flourished! Anyone have any pointers for Rosemary? @Curlijuli: yes, you want to give it at least 3-4" of stem, and at least one or two sets of leaves (those solar panels fuel growth), then cut the stem off above a set of leaves. it will fork and grow more basil. @Lorrie825 (and others): I talked to a farmer about rosemary and after 30 years of growing it, his response was, "that rosemary is a plant that just don't want to live." @Anonymous: depends on what green worm you are talking about. Usually butterfly or moth caterpillars are the pests that bother plants the most. I have personally found my dill is a favorite for local caterpillars. If they are large, pull them off by hand. But to really advise we'd need to know what the bugs were. @Vross: lemon grass IS NOT the same as lemon balm. Lemon grass is a tropical plant that will die back in colder regions, but can often be kept alive in a pot through the winter, especially if your house gets good light. Lemon grass is an ingredient used often in Thai cooking. Thanks for the great tips! I've been successfully growing dried herbs for years.... dried as in dead. Its nice to know what I've been doing wrong. I'm excited to try again!! These are great tips! I'm totally guilty of letting my college-boy basil plant grow flowers. I secretly do it and pretend that I don't know what's happening to that my fiance doesn't try to give me pesto with every meal! Excellent post, I found you on Pinterest and caught my attention. My sprig of cilantro died and I'm trying to make albahaca in my kitchen window. What do you recommend for those pesky snails? or as basil plant through chunks "V"
One question about Basil... if left to go to seed will it come back next year? I have a friend that said hers does but in all the years I've been growing it, I've never let it go to seed. I start with a new seedling each spring. I'd really prefer to have it come back on it's own. Regarding Rosemary and Sage... I've also been growing these for years. In the ground at my old house and for the last 6 years in pots at our new house due to the earth here is 95% clay. I have found that they both love a good soaking every now and then. If you see any dead leaves or branches, cut them off. For Rosemary, the bigger the pot the better it does. Both even stay green through our Va. winters. Watch out when planting lemon grass in your garden as it is an invasive plant too. But a great plant to grow to help keep mosquitoes at bay, as well as used for cooking. We unsuccessfully try to grow cilantro so many times and its nice to see we are not the only one that has issues. We switched to mexican or thai cilantro and it worked for us much better. It looks totally different and does have a slightly different taste but close enough for us to be able to use still use it as a substitute. Interesting points about growing basil. If I am late planting seed - I cheat and buy a pot of basil from the supermarket. This I split into at least 6 parts and plant each part in the greenhouse. That way I get basil leaves straight away and when split like this and put into fresh soil they really flourish and provide lots of pesto green really quickly! Thank you so much for this post..it's very helpful and I just realized I've done these very same things to my basil! I wondered what was wrong and now I know. I have just started a small herb garden in half a wine barrel. I planted Rosemary, Sweet Basil, Coriander, Oregano, Chives and parsley. I live in Melbourne and Spring has just sprung! My Coriander and Rosemary are doing feel - Coriander is so tall and leafy! Oregano starting to turn yellow and not really grown...thinking its been overwatered (by the rain :/) think i will transplant into window box tomorrow to give better drainage and more space to grow undercover from the rain but still in full sun. Chives are limp and looking a bit sad... don't know what to do with them? Basil had a disease which i think it had when i bought it but it was the last one left and i really wanted basil... once home and planted i started to notice leaves were being eaten and a few tiny black bugs around so i removed it, repotted it and removed affected leaves, sprayed remaining leaves with homemade natural bug killer (rind of one lemon left overnight in 1 ltr of hot water, strain, bottle and spray-works a treat!) watered the plant anad placed un upturned jar over it like a mini greenhouse. I call this quarantine. Basil is doing better, no more signs of bugs and new leaves are starting to shoot so I'm happy! Just took some Rosemary cutting to propagate- hoping they will root within 2 weeks? My neighbour also gave me a couple of sorry looking stems of mint which i have planted into a wooden window box as i know it would take over anywhere else-a few yellow leaves but big green healthy looking leaves otherwise, hoping it will start to flourish by the end of spring! Lastly i am attempting to grow a few herbs from seed- have basil, chives, thyme and sage growing at the moment. Planted the sage first and it has produced 8 seedlings (out of 20 seeds) the largest of which is about an inch tall a the moment -i plan to transplant when around 3 inches tall. my other seedlings have JUST started to emerge - I've forgotten which one is which though so that will be fun later! will definitely need to thin them out soon but not sure at what stage to do this? Becoming a tad obsessed with herb gardening lately so the passion is there i just hope i don't lose any of my plants along the way! There is another variety of cilantro that is smaller (low to the ground) and spikey, with broader, longer leaves. My mom grows it sucessfully and claims it tastes the same, except the texture. She says it is the kind they use in Mexico, but I have never looked into it. NEVER plant mint in your yard/garden!! The previous owners of my house planted mint in front of the house and it completely took over! I didn't realize what it was at first but had to go through and clean all of the dead parts away (birds had even been trapped in it and died because there was so much of it before I moved in). It started growing out into my front lawn. I had to constantly dig up the mint, including the surrounding dirt, and get rid of it because every root or piece of the plant is a potentially new plant. The roots run horizontally underground and shoot up vertically. My yard is a disaster right now because of it, but after a little over a year and an entire 65-gallon garbage can of dirt/mint being dug out of my yard, I think it's gone. My neighbor was even concerned about it spreading to her yard. Read your post a few months ago and learned that my basil was too tall. I pinched off several branches where you suggested and put the pinched off branches directed into a cup of water where they rooted.Now I have basil to share. Thanks for the info. Any good ideas on how to grow chives?. Just shared with our readers, we love to promote fresh herbs and veggies! I'm a bit of a novice foodie/ gardener myself and live in an upstairs apartment in el paso tx... and am half Mexican. So cilantro, though enigmatic, is a necessity in my cooking. The trick to getting it to thrive is putting a bit more sand in the soil mixture and to grow from seed. And like the reproductive basil, DON'T LET IT FLOWER.and plant a lot in a large pot, full sun, water daily, and when harvesting, cut the stalks about 2-3" from the base, and then leave alone for a couple of weeks. If you need more, cut some new stalks from a different part of the pot, and don't be afraid that you need to thin them out, they'll grow happily like sardines. Just plant enough to handle your kitchen needs, that's why i plant a LOT. then just wait til that part regrows, and use other plants. Great tips - thank you! I discovered Lemon Basil this year and think it's amazing. It went crazy in the garden without any water, even in the hot summer months. I bought an already grown dill, about five or six inches. I replanted it in a pot but now it is starting to decay. Can some one tell me some tips to take care of it? Great info on this post. I planted one basil plant last year and enjoyed fresh basil pesto. I also planted rosemary and it made it through the winter frost. I love it on pork. I appreciated your article and had to laugh about the mint and oregano comments. I think we just might be able to strike a blow to erosion with the hardy mint and oregano plants! I have been growing herbs for several years and I absolutely love it! I grow sage, basil, flat leaf parsley, oregano, mint, and thyme. Try as I might I have never had any success with cilantro. It makes me feel a bit better to see that other people can't get it to grow either. I just thought I was doing something wrong. I think this year I will be expanding my herb garden to include dill and chives. Nothing in my garden gives me more continuous joy than my herbs! So... I made the mistake of planting my mint in my ground garden. It went gangbusters. Can you please tell me what I can do to kill it ? I want to take it out and plant cucumbers, last time I tried this it came back and killed my poor cukes! Thanks again for all your tips!! I was, just this morning, looking at my last surviving herb (mint) and its long, pathetic, scraggly stems with hardly any leaves and thinking, "I really oughta google this.." Well there was a link on my Pinterest feed to this handy blog and wouldn't you know I've been sabotaging my poor herbs. Now I know! After my oregano and English thyme succumbed to an unknown white fuzzy parasite I'm glad it's just me doing the damage this time. Just before last fall's frost I cut the tops off my basil, put them in water to root and then planted them in soil in foam 16oz cups. They are happily growing on a windowsill and I have fresh basil all winter. Because herbs are kind of like college boys: if you give them half a chance, they will focus all their energy on procreation and neglect growth. some good advice. here in central Canada most herbs wont survive winter so taking over is not a problem. growing cilantro, parsley and dill are truly the easiest of all the herbs. yes, start with seedlings(except for dill) and just let grow. when plants are several inches high they can be harvested, cut no more than 1/3 of the plant and they can be cut close to the ground. let regrow and harvest portions not harvested before, again, no more than 1/3 of the plant. dill grows fast and easy from seed, even reseeds itself here in central Alberta. Does anyone else have trouble with cilantro? Only herb I have trouble with. After one picking it doesn't grow back. Doesn't matter if I pick a little or a lot. Help! I am in Canada and I have been trying to grow many different herbs. Rosemary has done well in old soil with only partial sun and only infrequent drowning. I have also found it helps to grow it against a brick wall. It seems to love the reflective heat. I have also found that as long as they try is buried in snow you can continue to use it true the winter. As for thyme,dill,and mint, I haven't been able to grow any of them from seed or keep them alive for very long. The weather here seems to be too chaotic for them to survive unless they are under a lamp in a greenhouse. Great tipps though. I am going to try some of them once I get a lamp. So glad I found your post on Pintrest. Although my plants grew last year in pots, they were just puny. This year I will try again, following your excellent advice. Thank you!! Don't forget that catnip is a mint. Plant it in a pot! I just read your article and have learned so much. I have killed more basil plants than I care to count I just bought another and wanted to try to keep this one more than a season. I want to say though cilantro is the only herb I have had great success with. The way I grow it is to plant it outside as it will get really long roots and I pull off what I want to use but let it get flowers and form seeds when the seeds appear I pull them off and plant more I try to plant every three weeks so that I always have fresh cilantro. Where I live I can usually keep it going all winter there will be about 4-6 weeks when I can't find any but after they start reappearing they don't stop all winter. Thanks for the great info. post. My experience with Cilantro is that it loves warmth but not so much direct sun. I had to keep shade cloth over it even in the cooler months in the desert. It also likes constant moisture, don't let it dry out. If you try to start it early spring you may not succeed without startong it in direct sunlight for most of the day and covering it with plastic wrap until you see the first signs of germination. If your nights are too cold this won't work but you can grow it in a flat (roots are pretty shallow) that is placed on a heat mat for night time temp. control. Again, be sure to cover the flat with a lid or plastic wrap until germinated. Good luck, fresh cilantro is great. Anyone have any advice on growing my all time favorite, tarragon? Love the scent and wonderful in salad,chicken and combined with goat cheeses. Can't seem to grow it as well as the other herbs in my kitchen garden. Great points. I have been growing herbs indoors and of course made lots of mistakes myself. Right now I have a new large leaf basil growing and I'm pinching early and often. Plus I removed about half of the basil I started to give room for the rest. Just found your blog on Pinterest also. I have been growing herbs for many years and I recommend pots or planters for basil, mint, cilantro, Thyme, parsley and chives. In my herb garden is where I grow the bushy, woodier herbs such as sage, lavender, oregano, rosemary, bee balm, the perennials. My husband built me planters around the wall of our patio out of landscape block and they work perfect for the herbs and are right outside my kitchen so I don't have to go out to the big garden to get them for cooking. I love growing herbs. The chives have been in the same concrete planters for about 10 years and still thrive. I have never changed the dirt or fertilize. There is also thyme growing in with the chives. Lil' old herb lady. Love this post! Growing herbs in one of my favorite things. I did about 20 last season, and may go for a few more this year. I think your list should have one more mistake: not growing in pots. :) I think herbs do so much better in pots and because so many of them can take over everything else, it is a lot less hassle for the gardener. My cilantro tends to do better without full sun and needs more water than my other herbs during the peak of summer. My sister however, completely ignored hers and ended up with a forest of cilantro. It is a weird little plant. So sensitive to some and not to others. For the person who asked about dill: did you transplant it into a deep pot? Dill needs a very large pot (at least 12" deep) because is grows from a single long tap root. Also, dill doesn't take that well to transplanting. You have to be extremely gentle with it, unlike other herbs. While it is very hearty once it gets going, it can be hard to please in the beginning. Good luck to everyone this season! I totally made almost all of these mistakes! The one I was good about was plucking the flowers. Thanks so much for the harvesting and pruning advice. My basil definitely got top heavy and fell over. I love how you explain the reasons behind it (giant solar panels) to help me remember. The one I had success with growing from seed was sage, but alas only use it occasionally in cooking. This may read stupid, i am not from USA, I moved a few months ago and where i live the weather drives me crazy one day we are 90 degrees and the next day 32, how do i take care of my plants like that, do i keep them inside??? help me please. @Emy: Thats a tough question that depends in part on what kind of gardener you are (or want to be). I dont like to fuss any more than necessary, so I tend to try a bunch of different plants and varieties, and then continue to work with the ones that grow best in my area. So if you want a minimalist approach, try different herbs one year and see which ones survive the wild temp swings best. Another approach is to try to grow many of your herbs from seed, which allows genetic diversity and natural selection to encourage the growth of those that do best under your conditions (rather than the conditions of the greenhouse where your transplant was born). Alternately, a number of herbs will grow inside fairly well. I always overwinter basil, rosemary, thyme. Alternately, some folks put up shade cloth above their herbs on very hot days, so they get morning sun and afternoon sun, but are spared the worst of the mid-day heat. I planted cilantro in my garden as well. 4 small plants in a diamond shape about 6inches apart in the ground. I live in upstate NY and it lasted all summer and was the last thing still living into November. In the ground and not a pot seems best for cilantro and it made the most amazing salsa all summer long! I've been growing from seed for 2 yrs. Only started herbs last year, basil, parsley, and thyme. I bought a chive plant our first year in our house. I still have that plant, only a hundred times larger. Winter lasted so long this year I planted late and will probably buy seedlings for my veggies this year. My parsley is sprouting nicely, but only 3 cilantro sprouts, and 4 dill so far. Thyme survived the winter. I have a spot by my front fence where some wild mint just showed up last year, and it's trying to come back this year. I like the way it smells but I don't use it in cooking much. I'm not sure about growing year round but I have a 6" pot of garlic chives and it can not be killed. I grew it from seed 3 yrs ago and for the 1st winter it got buried in a corner in the kitchen with no water or light until I found it in may. I watered it and to my surprise it came back. I also have regular chives outside and they come back year after year. Thank you for all the information on what should be avoided in order to plant the perfect herb garden. I will definitely take note before planting the next herb in my garden. I also love the layout of your blog, and the simplicity of your writings. It’s amazing how you convey your blog content to the readers. However, I hope you would give more specific herbs reviews. Apart from that, I love your blog! Thanks for sharing! Thank you for all the information on what should be avoided in order to plant the perfect herb garden. I will definitely take note before planting my next herb in my garden. I also love the layout of your blog, and the simplicity of your writings. As a herbs lover myself, i like to prepare foods with fresh herbs and always wanted to plant it on my own. thanks to this blog, it is very informative and detailed. i cant wait to try it out and of course, avoid mistakes mentioned. thank you for this information. What a great post! Entertaining, informative and I could relate to the content. I really enjoyed reading it. Thank you! We have a large (about the size of a tennis court) "truck garden" in the back yard and your tips are not only useful, they are 100% correct. The tip about planting pots in the ground with some varieties I got early so the "Mint Dudes" haven't taken over the "hood". I have about 20 herbs, almost 40 varieties of veggies and for the second year, have planted a few varieties of heirloom tomatoes...worth it worth it worth it!! We also have 20 'bushes' of raspberries, blueberries, boysenberries and strawberries that we can enjoy all year round thanks to preserves, jellies, jams and freezing. I grow cilantro and most of my other herbs from seed. I put them in pots though, they make my front porch look very welcoming :) I have some helper mammoth dill growing in my front flower beds that must have seeded themselves from last years potted dill. So, what if I made the mistake of planting mint in the ground? lol-because I did. About 3 years ago, and have been pulling it out just about every other day, because it has taken over the garden. Is there anything I can do? THYME: I have always grown it and have had plants last years and years. In the last 7 years I moved right by the ocean with the ocean breeze. Every single thyme plant I brought died from the ocean breeze. I love thyme and was bummed I could no longer have it fresh without spending a bomb. The solution was simple. I grew a big pot of it from seed. Densely planted. The seedlings grew acclimatized to the ocean instead of being shoved in it from some other climate. Now 3 years later, that same plant is still growing strong. I keep it trimmed like a 2 inch lawn, still densely planted. Fresh sprigs pop up and I snip as needed. When the plant flowers all at once, I do a mass prune and save all the flowers for edible flowers. Delicious. My mint patch is older and spreading....and the mint leaves I just picked tonight have almost no mint flavor! What should I do? Does it need compost applied? Does it need to have some of those runners pruned back? Help!, I am bummed!! I live in Vermont at 1400 feet elevation, if that makes any difference. I planted my garlic chives five or six years ago and they're still going strong, however I'm in Louisiana and have had the same rosemary plant for two years as well. My growing season is a little longer than most but those garlic chives are wonderful. Sage, catnip, and catmint will spread as well--especially catnip if you let it go to seed! Thank you for your article. It was very useful. I accidentally pinched off my basil below the point of new leaves and I'm worried they won't grow well, as there are no new leaves at the top of the plant. What should I do? please advise. Much appreciated. thanks for your post! I have had problems growing basil/mint on my kitchen windowsill in pots. I get part sun/part shade...any suggestions? I put some rocks and soil in an old fish tank - and put dill and cilantro in it from seed..it's growing. But i didnt know cilantro didnt like sun so much. I have it on the west side and i have no shade. Also didnt know how deep the roots get. I barely acknowledge them - and figure this was just for fun - so if they dont make it - i hope the dill does. We shall see. Thanks - and i agree - basil is so easy to grow. Yet last year i kept the seeds inside and tried to use them this spring, but it didnt take. I dont know why. I'm in WA and I've never had a problem with Cilantro.. we do both pot and bed and love that the same plant is Coriander. :) Make sure you cut instead of pulling.. it'll regrow. Cilantro has a long tap root, so when planting in a pot, its best to use something 12". Not doing so could be the culprit of the poor luck in container growing. It doesn't respond well in the shallow containers that work well with all your other herbs. Hi, my girlfriend and recently started growing some plants on our balcony in new York city. We grew them from seeds and they were all doing really well then, I noticed tiny green and red bug crawling around in the dirt. I haven't seen them in awhile but now my plants are all dying from the stems up. My mini roses I had to throw out, it broke my heart, I loved them. Would you possibly know why or what the bugs are? This couldn't have come across my screen at a better time - my basil is gorgeous, but was just starting to get flower buds. My cilantro...I fear it may be a lost cause, but reading this post and many of the comments certainly gave me some good answers as to why it looks the way it does. Going to try cutting and replanting in a better pot and see what happens! I wish I had found your post sooner! I just planted an herb garden this year and seem to have done it ALL wrong. I didn't clip them soon enough, or enough, I saw flowers and thought "OH! I LOVE FLOWERS", i planted to spearmint and oregano next to each other and started harvesting the 'solar panels'. Next time will be better! Thyme and sage keep coming back in our cold Zone 5 (north Idaho close to Canada) with no protection. Mint. Ah mint, it is much like glitter to a long-time crafter. Mint is the herpes of the garden. Lyndsay: Without seeing the bugs my guess would be spider mites. Sorry you lost your plants! My mealy cup sage is beautiful - I plant it solely for the blooms. However, about mid summer, it becomes so heavy it falls over with its own weight. I've never pruned it so I am wondering if I cut it back in the spring will still flower. I live in zone7. YES! Great piece, keep up the terrific work. This is the type of information that should gain recognition for it’s craft. More writers should learn from you. This is right on the money. great site i must say....very enjoyable stuff is placed here in a very appropriate way...thanks for publish this site…thanks for publish it..its a good attempt..
Great read, I took the tip of using the basil in vertical garden as an indicator as to water or not. this is a great post save one thing... i would NEVER want to put Miracle Gro on anything that i was planning on eating. you eat the chemicals the plants are eating. this principle extends to the soil you are using as well; organic potting soil is probably best. totally true about the mint. in fact, i can't believe they sell it anywhere when you can simply pinch off a start from any plant and start it with ease! With Cilantro, I plant it in a long windowbox, planting just a few seeds each week, starting at one end. By the time I've reached the end of the box the first plants are ready to harvest. I pull the whole plant out and plants a few seeds in its place. By doing this, I always have fresh young plants to harvest, which taste better than old tired plants. And I never have a problem with the plants bolting. Late in the season I let a few bolt and go to seed so I can have seeds for next year and to use as coriander. I made the mistake of planting mint at the end of a patio. It got crazy. I looks great and is contained but the patio and house. Mostly. after 21 years of fighting it to keep it out of the yard. I gave up for the most part. However it does smell good then you get the lawn more after it. I have a Rosemary plant that is least 4 years old. All I do is lift the plant out of the pot every year. Get a lot of the old soil off put some new potty soil in and round the plant. It is so big I give cutting to anybody that wants some. Hi there - great post thank you. Am trying basil for the first time in an apartment with very hot sun coming in the window in the mornings. Is that a good place to put the plant? In hot direct sunlight? Great post thanks. I am trying to grow basil from a small plant in a pot placing it on a window ledge inside my apartment. Very hot Australian sun pours in every morning for about 4 hours. Is that a good or bad place for the plant? try taking a plastic flower pot and sink that in the ground. it will prevent your mint from spreading. Also you could dig up the pot and bring it inside for winter months if you live in a zone that gets frost. This also works with wall paper trough- trays. just poke a few holes in the bottom with a screw driver. In general it has been my experience that basil likes sun inside, and handles a lot of heat during the summer, so the heat from being inside a house near a window shouldnt be too extreme (unless we're talking about inside a mini green house concentrating sun without any other temperature dispersion). Though my problem in cloudy north america is too little sun, not too much! I also have had great luck growing rosemary inside. I dont even bother to transfer outside every summer because I dont want to manage possible transplanting shock, and my perennially indoors trailing plant produces more than I need. It is three years old. I have found the trailing rosemary holds up better indoors, even in lower light, than does upright rosemary. @Fallen Serendipity: Sorry for the confusion! The idea is that between two sets of leaves there may be 1-2 inches of stem. If you clip just below a set, that extra 1-2" of stem would be left on the plant. For reasons I don't fully understand, the plant seems to like that less. If you clip just above a set of leaves, taking the 1-2" of stem off and leaving a pair of leaves as the topmost thing on the stem (rather than a stem stump), the plant seems to branch more readily. Does that make more sense? Great post! Also some very helpful tips in the comments. Trying indoor herb garden for the first time. From seed. Keeping my fingers crossed. It's interesting that the author said they have trouble growing cilantro. I have lots of success growing it. It even came back from last year. I brought it inside. Also, basil and parsley work for me. Rosemary and Thyme only seem to grow if I buy starter plants. All the advice seems to be point on and I am on the right track. Thanks. Thanks, Cattastroficka, I have not tried that yet. I start new each year. You are right, you can never have too much basil. I make Pesto to dip and spread and for pasta. In Tucson, I planted spearmint on purpose by the back weall, it goes the whole length of the wall now and when I mow the lawn it smells so good, and if I want some I clip it before I mow. It always grows back and I always mow it down. Don't be too harsh with the lemon balm - it is a very effective mosquito repellent! Bee balm and Apple balm will also take over like mint so be very careful when adding these plants to your collection as well. No one informed me of this and they took over my garden! I spend hours every year digging these three up. I'm in Texas also and your reply set well with me. Parsley was my concern because I bought 2 plants this year and right off the bat they started to bloom. I snipped the blooms on one and let the other go just to see what it would do. Thanks! Anyone can basil! Just water it daily and you cant go wrong! If it gets realy big and unmanageable then take 2or3 snippings and start all over again. I have been doing that for the past 3 years. Its happy witj sun or shade so its a won win. Great post! I've been following these directions and it certainly helps, my basil is growing rapidly. The issue I have with pruning ths way is that my basil seems to get too bushy. It feels very crowded and it's very tempting to just pull out some of the gigantic lower leaves to give it some space (and of course, to eat the big leaves). Any insights about what I can do here? Hi Skinny Gourmet- thanks for an excellent article! I've decided to grow herbs on my new condo's deck and I've never owned a plant in my life. I'm a foodie who loves to cook and I've always wanted to grow fresh herbs- and stop paying the ridiculous market prices. Plus, I'll know exactly what is in them. I'm off to buy a basil plant! Ok so, I have never planted anything in my life but I wanted some fresh herbs so I bought some seed packets and thought, "how hard can it be?" I dumped one packet into each pot with potting soil (cilantro, Italian basil, rosemary, mint, oregano) and within 3 days everything started growing! But now I'm realizing that I probably should not have dumped the whole packets in the pots! There are hundreds of little sprouts all over and they look very crowded! Are all my little plants going to die now? Awesome tips! Way better for beginners than half the stuff that comes up on pinterest! Thank you! I, too, found this through Pinterest. Thank you so much! So informative! I'm still a rookie at herb growing - have only planted sage, rosemary and thyme in a very large clay bowl for the past 2 summers ( in Ohio ). Thanks again! I have learned so much! Hi some great advice here. Thank you. Think you can do article on how to dry herbs ? Also I would like to bring pots in once fall/ winter approaches I thought if I get a grow light in would help. What do you think ? Thanks again for the great advice. Thanks for the great tips. Could you do one on drying herbs out. And I want to take herbs in when weather starts getting to cold but I really haven't had any luck growing during winter months. I am thinking maybe a grow light. Would love to see what tips you have for indoor growing too. Thanks again for the tips. Have a nice day ! Those of you who have the best luck with cilantro over the long haul live in the cooler climates. In SC, cilantro bolts and dies out when the summer heat arrives. I have never tried to let it re-seed. I have a large herb garden and yes it was trial and error in the beginning. Cilantro does seem to grow best from seed instead of buying plants and lasts longer that way. Here in Memphis, TN my cilantro reseeds itself every year and my oregano, mint, chives,parsley, rosemary come back every year as well. I have not had basil come back but then I keep it well pruned. I get 2 years out of parsley and then need new plants. I love using fresh herbs in cooking and keep a bouquet of them on my kitchen counter in a vase of water so I just have to reach over and take what I need when I need it. Good luck all. Many thanks for this write up on the herb gardening mistakes a newbie makes. I am so glad you posted about the pruning of herbs! I had no idea how to trim my green basil. I think I also have a purple basil variety but other people have said it is purple perillia. I would love to know if the purple stuff is edible or not. chocolate mint, sweet mint, spearmint, peppermint, IHOP mint (I rooted it from a sprig in my tea last year-no idea what kind it is), lemon thyme, lemon balm, sage, sweet basil, parsley, fernleaf dill, pineapple sage, and stevia. I'm growing herbs for my first time and everything is working well up here in Milwaukee, WI. One thing we decided to grow is cilantro. We're using a 12" pot in potting soil and I put some white sand on the top of the soil. We have a 3/4" plastic tray to catch water and our balcony faces south. It's rained a lot and I decided that since cilantro has a tap root, I'd leave the water that was to the top of the plastic tray just sit and see what happens. My cilantro has pretty much exploded with growth, and it was bought as a plant, not seed. It's a bit shocking to read all these stories of not much luck with cilantro since I've had mine 3 weeks and it doubled in size. I'm hoping this won't be a one time thing!!! Thank you for all these great herb gardening tips! Going shopping for a rosemary and mint plant to add to my collection. Now that I know how to harvest them properly, I am super excited to use them in my daily cooking! Thanks bunches! Having the right planters and pots for your plants can determine and change the way that they grow. This is why there are so many different types out there. These planters and pot are a lot more important then most people think. That is why you need to know what to purchase.